This work respectfully acknowledges all first nations of the state of South Australia and pays respect to the Spiritual Ancestors, Elders and Traditional Owners and Custodians, their customs, traditions, culture and in their protection and nurturing of this place; their tribal lands and waters. The purpose of this case study is to describe how Greater Adelaide, the capital city of the State of South Australia, applies the key principles of urban design for wellbeing and population mental health. It brings together the relevant history, current policy, as well as social and cultural context with the perspectives of local urban professionals, in an endeavour to provoke further discussion, collaboration and action in the endless pursuit to live meaningfully and sustainably. The scope of this study is Greater Adelaide comprising the City of Adelaide municipality, as well as 26 inner city, metropolitan and regional municipalities. Australia has three levels of Government or law making, comprising: Federal (or national) Parliament, which is based in Canberra, the nation’s capital city; state/territory Parliaments, in each state/territory capital city ;and local councils (also called shires or municipalities). Urban design refers to the creation of the places people live - our suburbs, towns and cities. It determines the appearance, scale and ambience of a place, and is influenced by political, economic, environmental, social and cultural life. The World Health Organisation defines mental health as a state of wellbeing in which every individual realises his or her own potential, can cope with the normal stresses of life, can work productively and fruitfully, and is able to contribute to her or his community. A search was conducted on South Australian Government websites to identify relevant policy documents. These were retrieved and assessed, and relevant sections were identified and extracted. Further policies mentioned by interviewees and survey participants were also examined. Ten Adelaide based academics, public health specialists, municipal and State Government administrators, wellbeing and mental health practitioners, urban planners, urban designers, developers and architects were identified using snowball sampling. Semi-structured interviews were conducted, and each subject was asked about what they considered to be urban design factors that support good mental health. An online survey was conducted comprising thirty one (n=31) responses (presented in italics throughout the document) from academics, public health specialists, municipal and State Government administrators, wellbeing and mental health practitioners, urban planners, urban designers, developers and architects. The Greater Adelaide region is built on the traditional lands and waters of five of the world’s longest enduring cultures; Kaurna people across the Adelaide Plains, Ramindjeri, Ngadjuri and Peramangk people throughout the Adelaide Hills and Ngarrindgeri people in the south. 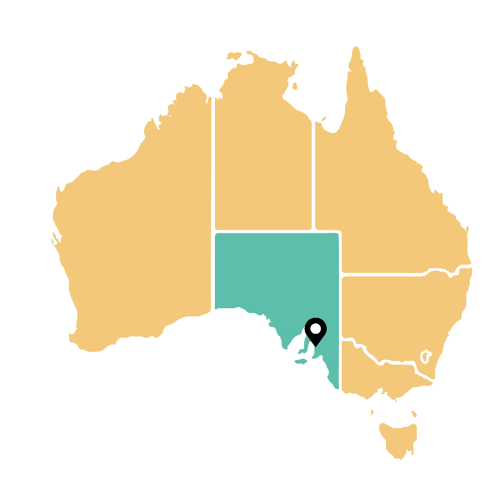 Greater Adelaide is now home to almost 1.5 million people from over 200 culturally, linguistically and religiously diverse backgrounds, accounting for nearly 85% of South Australia’s population. (ABS June 2016, 2). Colonised in 1836, Adelaide (named after Queen Adelaide) was designed by Malaysian born British Surveyor General Colonel William Light. Adelaide’s signature grid layout, with alternating wide and narrow streets, interspaced with six public squares and the meandering Karrawirraparri River (River Torrens), feels like a city in a park. It is one of the few remaining garden cities in the world and recognised as a National Heritage site. 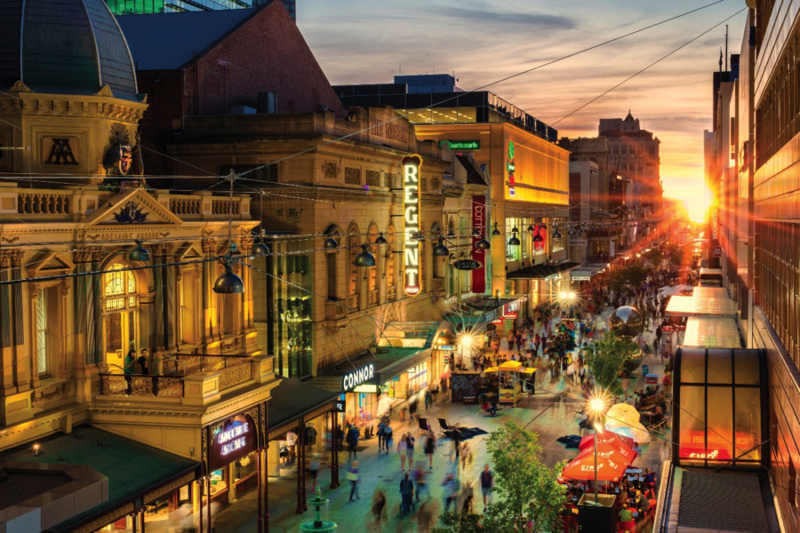 Designed for the good life, greater Adelaide in South Australia is defined by its liveability, characterised by its thriving arts and cultural scene, premium food and wine, affordable living, short commute times, stunning beaches and a unique natural environment. Adelaide’s weather is often described as Mediterranean, experiencing cool to mild winters with moderate rainfall and warm to hot, generally dry summers. It has an average maximum temperature of 29°C (84.2°F) in summer and 15 - 16°C (59 - 60.8°F) in winter. In summer the average sea temperature ranges from 19.7 - 21.2°C (67.5 - 70.1°F). The annual rainfall is approximately 550mm. 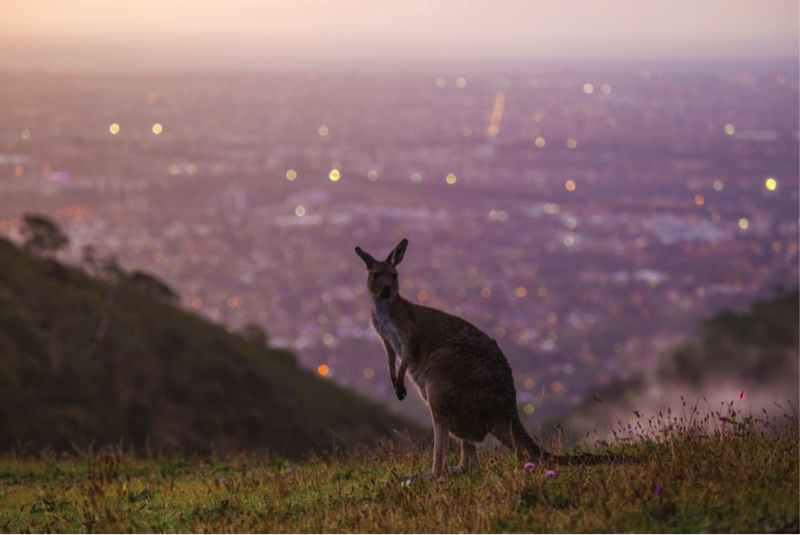 Greater Adelaide is nestled between ‘the hills’ of the Mount Lofty Ranges to the east, studded with small townships, nature parks, ancient Aboriginal rock art, walking and cycling trails as well as world class food and wine producers, and bordered to the west by expansive pristine beaches. The abundance of Edwardian and Victorian architecture constructed in locally sourced bluestone and sandstone is most evident along the splendid boulevard of cultural institutions, galleries and museums, including the South Australian Museum showcasing the some of the finest and oldest known Ediacaran fossils; the first forms of complex life, and the Botanic Garden – which hosts a State Herbarium and a Museum of Economic Botany; the only remaining of its kind in the world. Yet amid the prosperity, Adelaide faces several persistent cultural, social and environmental challenges that threaten individual and collective well-being. Intractable issues that have profound human costs, hamper economic growth, create inequality and increase the need for expensive public services. This includes substance abuse, the impact of climate change, a transitioning economy, modest education outcomes and unacceptable disparity in the prosperity, health and wellbeing of first nations people. It is anticipated that the population of Greater Adelaide is intended to grow by over half-a-million people in the next 30 years, meaning at least an additional 15,000 individuals living in the Adelaide CBD by 2036. Recent legislation against unnecessary and unwarranted urban sprawl under the Planning, Development and Infrastructure Act 2016, intended to protect precious food production areas, meaning that the majority (85% by 2045) of all new housing in metropolitan Greater Adelaide will be infill in established urban areas. (4) This modest projected population growth and commitment to urban densification presents an outstanding and exciting opportunity for the quality design of tens of thousands of dwellings, open spaces, community amenities and transport infrastructure that is good for people and the planet. 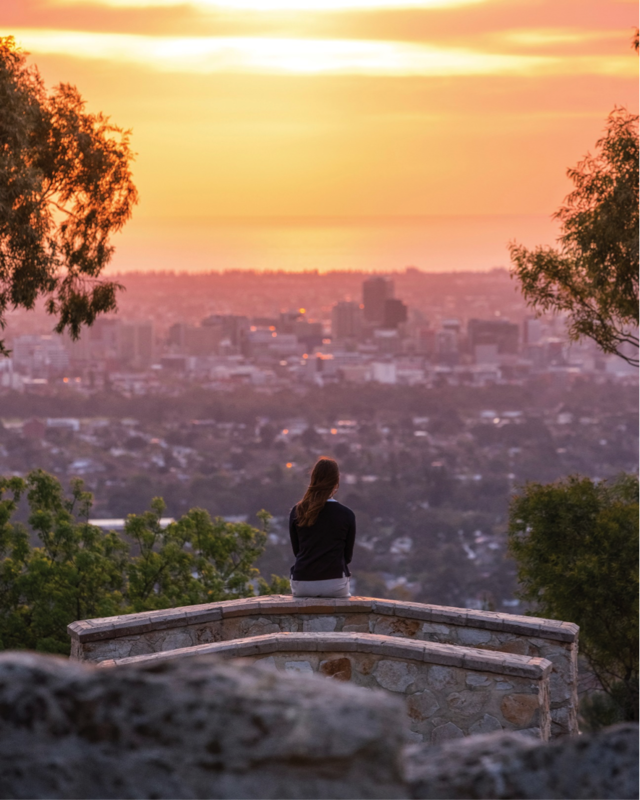 There is strong recognition among professional practitioners and government administrators in Adelaide of the connection between quality urban design, mental health and wellbeing. However, there was consensus that wellbeing and mental health are not currently prioritised enough, taught or measured holistically in residential, private or public development. While the consideration of wellbeing and mental health is intrinsic for many design practitioners, barriers such as the limited scope of functional briefs and financial constraints were cited as obstructive in achieving optimal outcomes. While the value of placemaking and place management is beginning to be preemptively considered in urban design, wellbeing and mental health are not routinely measured or reported post-occupancy. Quality urban design process, including the strategic development of the brief and genuine engagement with end users, was recognised as important for the ownership of outcomes and attachment to place. This section considers Greater Adelaide in the context of the Centre for Urban Design and Mental Health’s GAPS framework; Green places, Active places, Pro-social places, Safe places. Almost all (94%) South Australian’s value interacting with nature and strongly believe in the importance of conserving and protecting the natural environment (5). 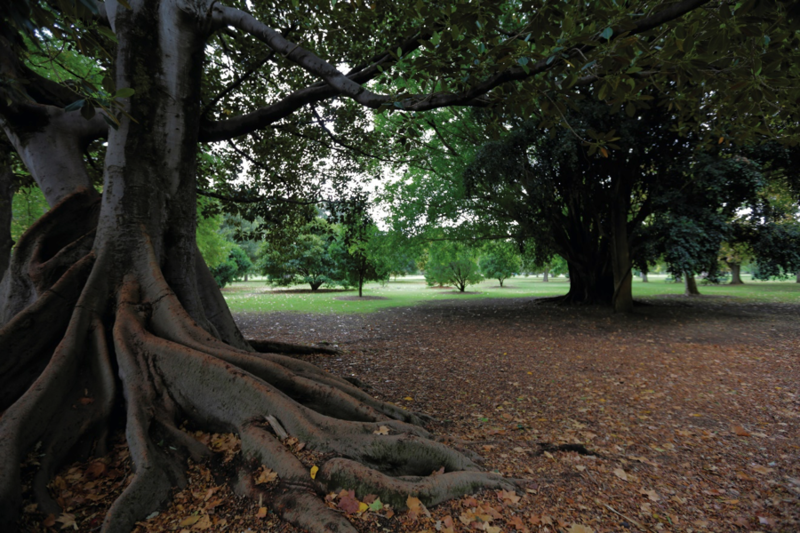 While there is a public perception that Adelaide’s green spaces are being protected, recent evidence indicates it is declining; from 2013 – 2017 there was a loss of tree and shrub canopy and an increase in hard surfaces (such as paved driveways) in 17 councils in Greater Adelaide. In response to the abundance of evidence which demonstrates that contact with nature improves physical health, psychological health as well as social and cultural wellbeing, the South Australian Department of Environment and Water, and the Department of Health partnered to develop and implement the Healthy Parks Healthy People South Australia 2016 – 2021 (6) framework. Release of the first Healthy Parks Healthy People SA Action Plan ‘Realising the mental health benefits of contact with nature’ and the development of a discussion paper ‘Connecting nature and parks to mental health promotion and mental illness prevention strategies in South Australia’ to embed connection to nature and parks in mental health promotion and mental illness prevention strategies through the Suicide Prevention Strategy 2017-2021 and the SA Mental Health Strategic Plan 2017 – 2022. Commissioning of University researchers at University of Melbourne and RMIT to complete an evidence review of how quality green space supports health, wellbeing and biodiversity. Release of the second Healthy Parks, People Action Plan, ‘Quality Green Public Space’ in August 2017 to promote the greening of the public realm through the South Australian Planning Reform and the implementation of the 30-Year Plan for Greater Adelaide. The development of ‘Principles for Quality Green Public Open Space’ to support a shared understanding of the value of green open space. A ‘Connection to Country for Aboriginal Health and Wellbeing’ workshop was convened and attended by over 80 people from diverse Aboriginal communities and organisations, to gain a deeper understanding of how Connection to Country can be better promoted and integrated into research, policy and programs across the health and wellbeing, environment and Aboriginal sectors. This information will inform a Joint Statement of Action for Connection to Country for Aboriginal Health and Wellbeing. Healthy Parks Healthy People has adapted the ‘5 Ways to Wellbeing’ released by the New Economics Foundation in 2008 and developed a public campaign entitled ‘5 Ways to Wellbeing in Nature’ which outlines five key actions for people to incorporate nature in their daily lives and enhance their overall wellbeing. 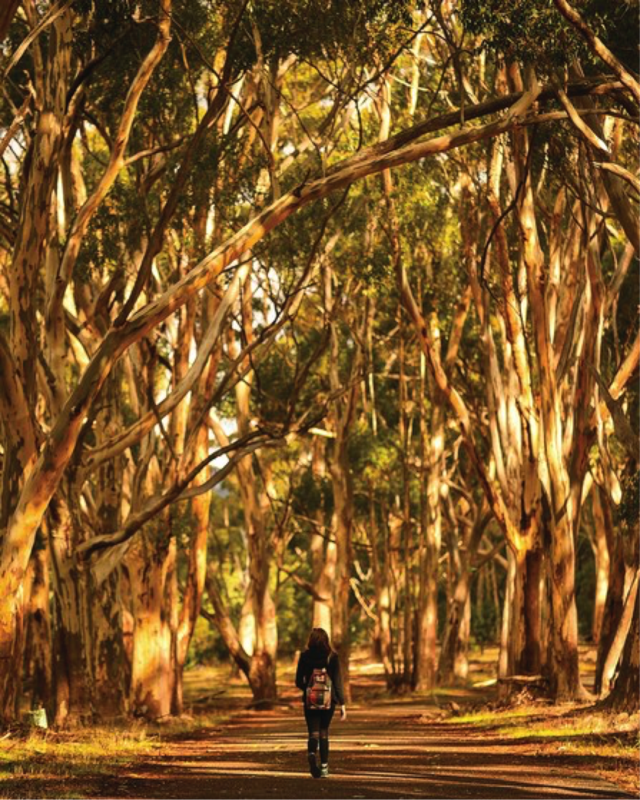 Acknowledging the economic, biophysical and social benefits of urban tree cover; trees and shrubs located in street verges, parks and backyards, the 30-Year Plan for Greater Adelaide aims to ‘increase urban green cover by 20% by 2045’ (Target 5). (7) Focus will be placed on ensuring that urban infill areas maintain appropriate levels of urban greenery. This target will support the work being done by councils through their tree strategies which address biodiversity and quality of vegetation. To protect the highly productive agricultural and horticultural land surrounding Adelaide, the urban footprint is being actively contained. By 2045, 85% of all new housing will be urban infill (Target 1) (9). Other benefits of densification include reduced car dependence, associated infrastructure costs, environmental benefits and better social connection. The cool temperate waters of South Australia host some of the most unique marine life on the planet. These include some of Australia’s most iconic species such as the southern right whale, bottlenose dolphin, weedy sea dragon, Australian sea lions, great white shark, little penguin, and giant Australian cuttlefish. These waters contain more varieties of marine life than the Great Barrier Reef, and around 80% of them are not found anywhere else on Earth. To protect our native species and the unique marine environment, South Australia has created a network of 19 marine parks, totalling 2.6 million square kilometres or 44% of the state’s waters. The Adelaide Dolphin Sanctuary is one example in the metropolitan area, just 20 minutes from the city centre, and features a 10,000-year-old mangrove forest. 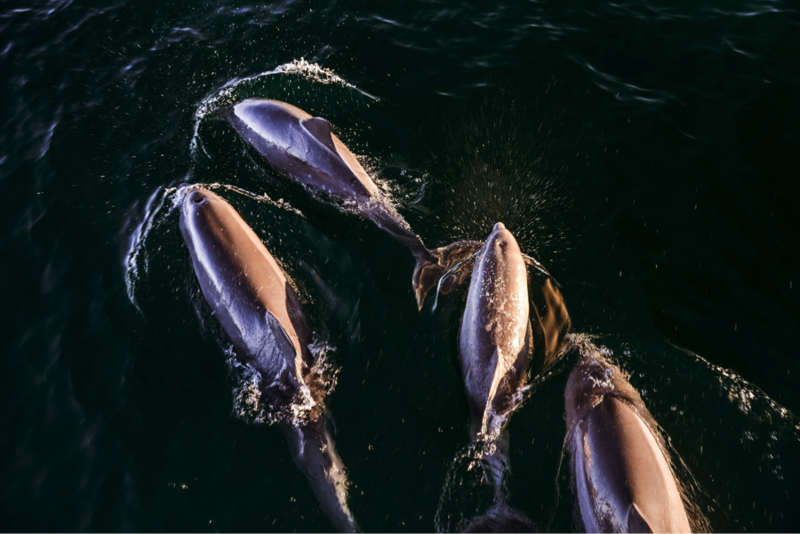 A resident pod of about 30 bottlenose dolphins live in the area, while another 300 visit the area regularly. Greater Adelaide has well established excellent informal and formal sporting, recreational and aquatic facilities and programs. 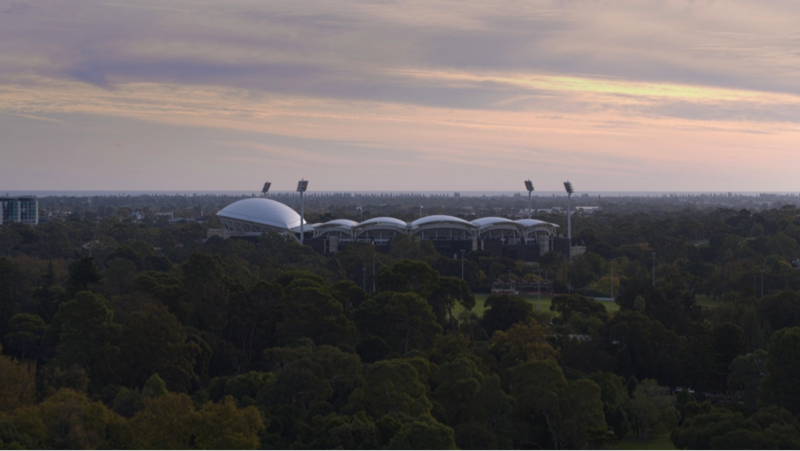 The Adelaide Park Lands, which surround the CBD, have over 207 hectares of sporting open space suitable for a range of organised sports, ages and abilities. The Office for Recreation, Sport and Racing has a vision for South Australia to be an active state grounded in the belief that sport and active recreation develops stronger, healthier, happier and safer communities. (11) People that cycle are healthier and less of a burden on the health system (Gill, J. and Celis Morales, Carlos 2017), make cities safer, create less pollution and generate few carbon emissions. In Adelaide, 31% of carbon emissions are from transport, of which 91% are from private vehicles. (12). Yet, Adelaide has the potential to be one of the world’s greatest cycling cities – it is very flat, the roads are uncongested and easy to navigate. However, commuting rates have dropped 20% over the past 6 years to 7% of the population (approximately 240,000) compared to 43% of the Dutch and 30% of Danes who cycle daily. This is despite recent legislation requiring drivers to allow a minimum of one metre when passing a cyclist (or 1.5 metres where the speed limit is over 60km/h) and is thought to be largely due to the aggression of car drivers and fear of collision. Adelaide has long been criticised as being too car-centric, with streets prioritised for vehicles, overly generous car parking, a dysfunctional ring road, under-developed public transport system, disconnected bicycle network, as well as a weak pedestrian network with delays on walking routes and frequent footpath interruptions. (Gehl, J. 2011) (13). The State Government has committed to increase the number of cyclists to 600,000 by 2020 and partner with the Adelaide City Council to invest in cycling infrastructure and provide protected dedicated cycling corridors east-west and north-south in the central business district as well as alongside train lines. Adelaide hosts the annual Tour Down Under event and has numerous coastal and regional bike trails as well as mountain bike paths throughout the Adelaide Hills and beyond. Acknowledging active transport as an important mode of commuting and its positive impact on public health and associated reduced health care costs, lower carbon emissions and less pollution, reduced traffic congestion, and improved community wellbeing and social cohesion. 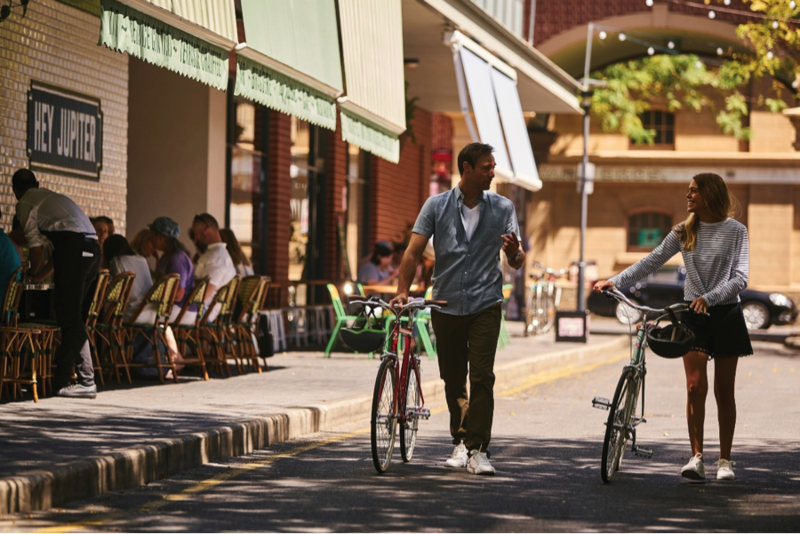 The 30-Year Plan for Greater Adelaide aims to ‘increase the share of work trips made by active transport by 30% by 2045 (Target 3)’. (14) This will be achieved in part of Adelaide by locating housing close to centres of activity, jobs, services and public transport to provide more opportunities for active travel for short daily trips (less than two km for walking and five km for cycling). Well-designed transport infrastructure is identified as key to encouraging increased usage as it provides an appropriate level of amenity and safety for users and a more pleasant and appealing journey. A five-year trial of a driverless vehicle has commenced, transporting Flinders University students from the campus to the train station in Adelaide’s southern suburbs and travels up to 30km per hour, which is also anticipated to increase active transport at either end of the journey. Adelaide values people with disability being able to participate fully in urban life with as few barriers as possible. Blessed with a flat terrain and community conscience, Adelaide pioneered ‘pram ramps’ throughout the city and suburbs in the 1950s. From the late 1970s, Adelaide had a strong government commitment to disability leadership, including people with disability holding senior roles in the State Government, which brought a lived experience perspective to education, transport, health and general access improvements. A thirty-year plan (from 1998) to create an accessible bus fleet is nearing completion with all of Adelaide’s trams and trains and train stations now accessible and almost 1,000 easy access buses retrofitted to include features such as seating for two mobility aid users and people with low vision contributing to Adelaide’s reputation as Australia’s most accessible capital city for public transport. The public domain in Adelaide’s CBD is largely accessible and signed, including raised tactile Braille street names at major intersections. The 30-Year Plan for Greater Adelaide seeks to increase housing diversity by 25% by 2045 (Target 6) to facilitate the supply of a diverse and well-designed range of housing types to cater for all ages and lifestyles, making the best use of land and infrastructure. Municipalities and the South Australian Government engage communities in a variety of ways on a diverse range of issues that impact urban life. Trust, accountability and transparency of government are recurring topics of discussion across many sectors including urban life. The State Planning Reform process, currently underway, includes a stronger emphasis on quality design as well as community engagement. A Community Engagement Charter has been established placing consultation and participation at the forefront of the planning process. The Charter establishes an outcome-based, measurable approach for engaging communities on planning policy, strategies and schemes. The Department of the Premier and Cabinet has a ‘Better Together’ unit that exists to enable Government to make better decisions by bringing the voices of citizens and stakeholders into the issues that are relevant to them. ‘YourSAy’ is an online consultation hub where citizens can find and provide feedback on consultations open across the South Australian Government. Municipalities across the state also use the ‘YourSAy’ platform to engage residents. Located in the heart of the cultural precinct, the Centre of Democracy showcases the people and ideas that have shaped democracy in South Australia and features programs and activities that challenge visitors to think again about people and power. There is growing recognition of the important correlation between how attached people feel to where they live and local gross domestic product (GDP) growth - the more people love their place, neighbourhood or city, the more economically vital that place will be. Beyond the function of experience with nature or social interaction is the construction of identity (18) through the reflection of one’s personal values as well as the meaning of experiences and histories of a place. In 2018, Adelaide became Australia’s first capital Welcoming City, joining a national network of inclusive, vibrant communities internationally recognised for their ability to foster a sense of belonging and participation. In August 2014 the City of Adelaide was declared a Refugee Welcome Zone, welcoming refugees and asylum seekers and acknowledging the difficult journey men, women and children make to Australia to seek our protection. The Welcome Centre is a safe drop-in centre for refugee families, people seeking asylum, and new arrivals to come together to access essential services and build genuine friendships. The collective identity and shared values inform the meaning of a place. There is also growing evidence of the positive impact of art interventions in public space in relation to better wellbeing and mental health including improved social relations, community cohesion, building civic pride, connection to place-based culture, stronger civic participation and greater use of public space. 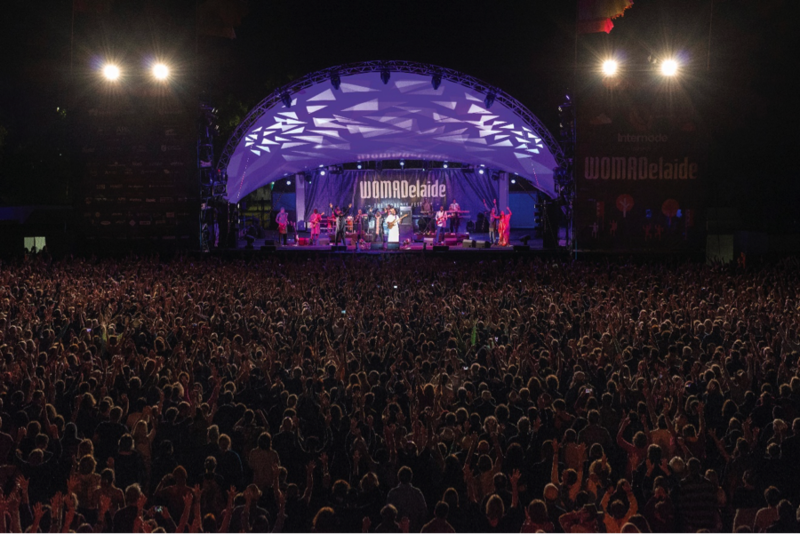 (20) Branded ‘The Festival State’ the South Australian cultural calendar explodes with a cluster of major festivals in the early autumn months known locally as ‘Mad March’ which comprises the Adelaide Festival of Arts, the Adelaide Fringe Festival, Adelaide Writers Week and WOMADelaide. 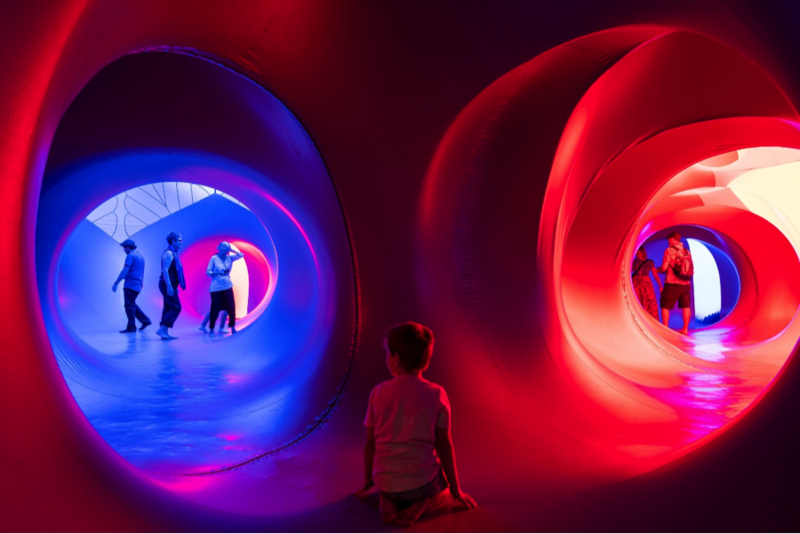 Held in the winter month of August, the South Australian Living Artists (SALA) Festival is the biggest visual arts festival in the world – boasting participation by over 9,000 artists across over 700 venues across the state. Other festivals held throughout the year include Tarnathi (a festival celebrating Aboriginal and Torres Strait Island arts and culture), Adelaide Festival of Ideas, the Adelaide Fashion Festival, the Festival of Architecture and Design (FAD), the South Australian History Festival, Dream BIG Children’s Festival, OzAsia Festival, Adelaide Cabaret Festival, Umbrella Winter Festival, the Adelaide Guitar Festival, Adelaide Film Festival and FEAST festival (an LGBTI celebration). As the home to people from over 200 cultures, a plethora of international cultural fairs also enrich Adelaide’s cultural calendar. As South Australia is home to 18 wine regions and Adelaide, the wine capital of Australia - a cluster of food and wine festivals including Tasting Australia, CheeseFest + Ferment as well as vintage and gourmet festivals hosted by each of the five major wine regions fill the calendar (and stomachs) of locals and visitors from around the world. 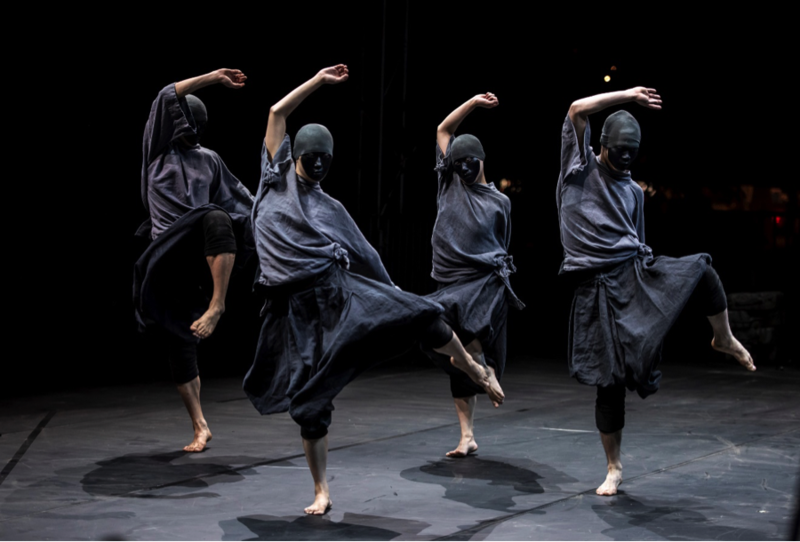 Adelaide is also a designated "City of Music" by the UNESCO Creative Cities Network and hosts three of Australia's leading contemporary dance companies; the Australian Dance Theatre (ADT), Leigh Warren & Dancers and Restless Dance Theatre – nationally recognised for working with disabled and non-disabled dancers. Public art is another important way that communities express collective identity, shared values and build meaning; to provoke a particular sentiment, express a certain narrative, be decorative, interpretive or commemorative. Public art can amplify the cultural value of a site, space or building and significantly contribute to the aesthetic and sensory quality of a construction project, strengthening a site’s connection to place and identity. (21) Public art is a broad term that refers to a range of artistic works in the public realm. Works can be in the form of enduring iconic pieces or stand-alone works, temporary installations, performative works, media works or integrated artistic elements. Works might include custom designed sculptural wayfinding and building signage, special seating in public areas, land art, art designed to be portable between sites, and specially designed functional public realm items such as recycling bins, bollards, drinking fountains, seating, retaining walls, lighting and planting. Figure 16: Michelle Nikou & Jason Milanovic, Glow (2009). 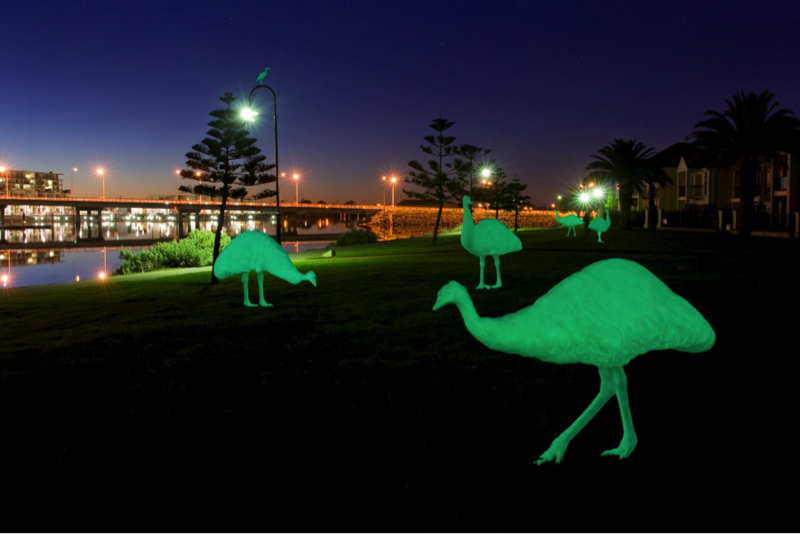 Images courtesy of Arts South Australia. Some municipalities allocate a percentage of development investment towards public art, it is the exception, rather than the rule. It is understood that the strongest public art outcomes are achieved through the commissioning of artists to develop site specific works. The response and concept of such works will consider location, scale, form, and materials. In contrast, the purchasing of works for installation is not responsive to site or context and is, therefore, less likely to make an integrated contribution to place. 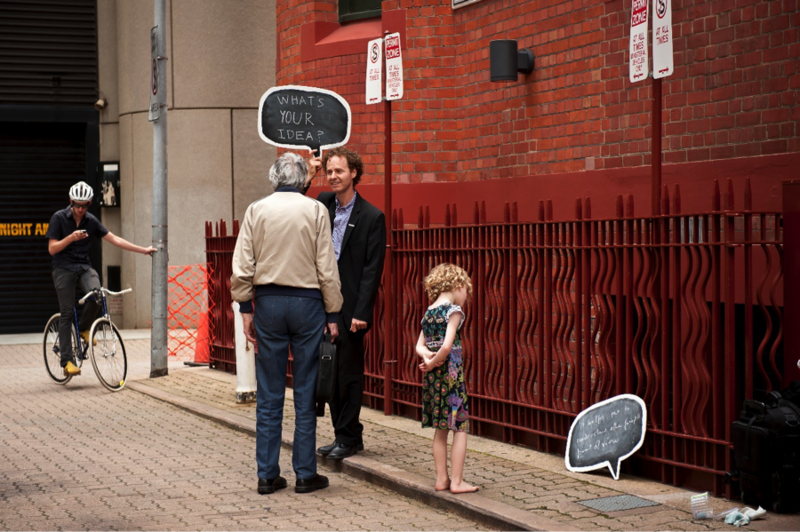 In 2012, a Cultural Impact Guide was developed in South Australia by the Creative Communities Network; an informal network of Local Government arts and cultural managers, officers and other practitioners. Five municipalities, State Government (through Arts South Australia) and the Local Government Association of South Australia partnered to develop the work as part of a broader Cultural Impact Framework. (22) The Cultural Impact Guide: a guide to consider the impact of any decision on culture is intended as a set of provocations for Elected Members to consider the impact of their decisions on culture. The Adelaide & Mount Lofty Ranges Natural Resources Management Board has used the Cultural Impact Framework to evaluate its urban sustainability program. The impact of art interventions in public space on wellbeing and mental health is not currently measured or routinely evaluated in Adelaide. In 2012 the State Government through the Integrated Design Commission hosted a ‘Design Lab’ to explore how to best address alcohol fuelled violence on Hindley Street; an Adelaide street notorious for alcohol related violence and aggression particularly in the early hours of the morning on weekends. The primary ‘hunch’ or insight that emerged from the ‘Design Lab’ was the need to dilute the density of drunk and aggressive primarily male individuals. This contributed to the inspiration to introduce small venue legislation in 2013, which made it easier and cheaper to open a small bar. 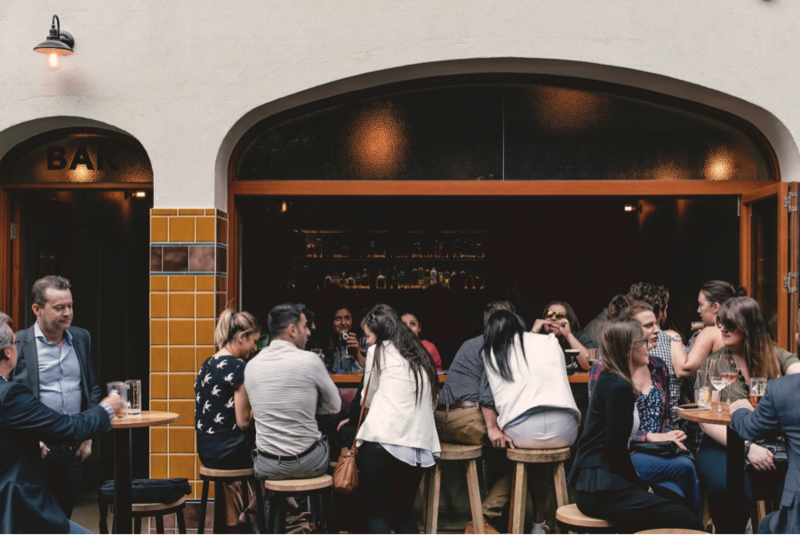 In the last four years, 94 new venues have opened across Adelaide’s laneways stimulating over 1300 jobs and over $90 million in economic activity and radically transforming and revitalising the ambience of the city. Subsequent placemaking initiatives including the use of ambient lighting are being used to encourage patrons to linger longer, while feeling safe as they wander through the city. Lighting is recognised as an important element of the city’s design, helping to improve safety and amenity, improving the quality of public spaces, a crucial aspect of supporting an evening economy which forms a pillar of the City of Adelaide’s Design Principles. In 2013, the South Australian Government also introduced ‘lock out’ law, to curb alcohol fuelled violence in the city. The law stops people from entering venues after 3:00am, as well as a restriction on the sale of some drinks and a ban on glassware after 4:00am, which has reportedly resulted in a 25 per cent reduction in alcohol-related crime. The value of good design is formally recognised at both the State and City of Adelaide level as fundamental to improving our quality of life and creating sustainable developments and environments that bring lasting benefits to communities. However, not all municipalities across greater Adelaide acknowledge quality design to the same extent. South Australia’s planning system is currently amid generational reform. Building Policy- minimum standards for building and construction work. In April 2016, the South Australian Parliament passed the Planning, Development and Infrastructure Act 2016 to implement a new planning system (replacing the Development Act 1993). This new legislation introduces the biggest changes to the South Australian Planning System in 25 years and will affect how development policy is formed and amended and how development applications are lodged and assessed. The new system aims to be ﬂexible, transparent and easier to use with faster and more consistent planning assessment processes, with greater emphasis on the importance of good design and community engagement. The state’s current planning policies are hosted in the South Australian Planning Policy Library. As part of the new system, the draft policies set out a state-wide framework for land use planning in South Australia that aims to address economic, environmental and social planning priorities, including housing supply and diversity, climate change and strategic transport infrastructure. The Principles of Good Design (24) are embedded in the draft State Planning Policies. The Office for Design and Architecture South Australia (ODASA) have developed a practical framework for how good design practices can support better outcomes for the benefit of communities and neighbourhoods and demonstrate the government’s commitment to achieving design excellence in South Australia’s built environment. Context - Good design is contextual because it responds to the surrounding environment and contributes to the existing quality and future character of a place. Inclusive - Good design is inclusive and universal because it creates places for everyone to use and enjoy, by optimising social opportunity and equitable access. Durable - Good design is durable because it creates buildings and places that are fit for purpose, adaptable and long-lasting. Value - Good design adds value by creating desirable places that promote community and local investment, as well as enhancing social and cultural value. Performance - Good design performs well because it realises the project potential for the benefit of all users and the broader community. Sustainable - Good design is sustainable because it is environmentally responsible and supports long-term economic productivity, health and wellbeing. Design Review is an independent evaluation process in which a panel of built environment experts review the design quality of development proposals. It is a reliable method of promoting good design in South Australia and improving the quality of design outcomes in the built environment. Design Review mechanisms are a free, confidential pre-lodgement service offered to developers by both the South Australian Government and City of Adelaide, guided by the Principles of Good Design and the Adelaide Design Manual respectively. The Adelaide Design Manual sets the direction and standards regarding the design and management of high-quality, durable, flexible, accessible and sustainably designed public spaces in the City of Adelaide. The Manual builds on the city’s current strengths and draws from past experiences, locally, nationally and internationally, in urban design and sustainability principles providing future design direction for public spaces. The Adelaide Design Manual is a toolkit for designing the streets, squares, laneways, Park Lands and public spaces in the city. Street Types, which defines the major streets by their function, use and movement, reinforcing their unique character and scale, and creating a long-term vision for the city. Street Design, which provides a range of technical and strategic approaches for creating integrated and sustainable streets that support and encourage city life. Furniture and Materials, which contains guidance on the elements used in the city’s streets for a consistent, complementary and high-quality approach to selection and placement. Greening, which provides the technical and strategic guidance for increasing trees and plantings in the city in a sustainable way, contributing to environmental and lifestyle benefits. Building Frontages, which explains how private buildings that face public spaces can contribute to a rich and diverse city experience through detailing and thoughtful design. Lighting, which provides approaches to lighting that complements the city environment, improves safety and amenity, promotes sustainability, and builds on the city’s lifestyle and character. The Healthy by Design SA (25) website is a toolbox for creating liveable active places and spaces in South Australia. Many of the resources and information provided on this website have been developed locally for and by South Australians. Published in 2012 by the Government of South Australia in partnership with the Heart Foundation and the Planning Institute of Australia, the compendium reinforced the concept of ‘link and place’ to policy makers and designers, quantifying road width in relation to footpath and verge width and has influenced subsequent urban design and renewal. All South Australians will experience the impact of climate change on their health and wellbeing. Understanding the risks, identifying and supporting vulnerable members of the community and developing appropriate urban design adaptation strategies will be critical to the success of healthy cities globally, including Adelaide. Adelaide is getting warmer (overall 0.96°C warming between 1910 to 2005) and is projected to become drier with heatwaves more frequent and more severe. The number of days over 35°C in Adelaide projected to increase from their current average of 20 to 24-29 by 2030 and to 29-57 by 2090. The fire season is likely to start earlier with an increase in the number of fire danger days. Annual rainfall is projected to decrease, but the intensity likely to increase. Sea levels are rising 5 mm per year in the region and projected to rise a further 60cm by 2090.Gulf and ocean waters are warming and are also becoming more acidic as a result of absorbing higher amounts of carbon dioxide from the atmosphere, threatening marine biodiversity. (26) Temperature rises exacerbate the urban heat island effect caused by a density of hard surfaces, predominately with darker, heat-absorbent materials, loss of tree canopy cover and green open spaces, grassed areas and planted areas. Australia’s first climate change legislation was enacted in South Australia. 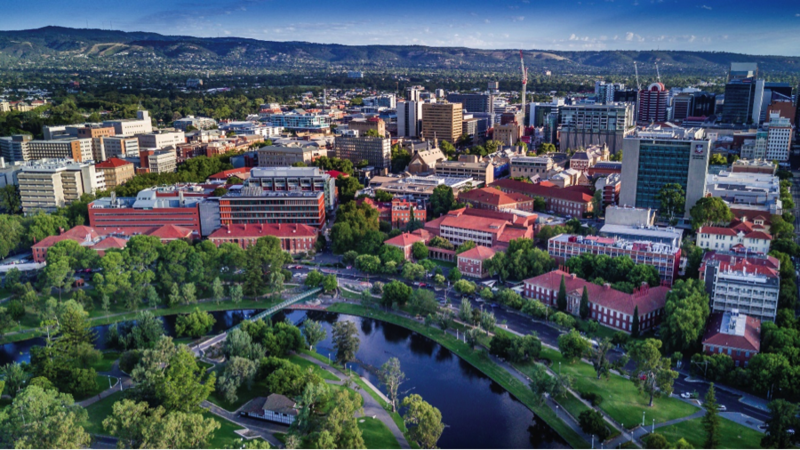 Carbon Neutral Adelaide is an ambition to make the City of Adelaide the world’s first carbon neutral city – to achieve zero emissions by 2050 (27). The Adelaide & Mount Lofty Ranges Natural Resources Management Board has developed Climate change Adaptation Plans with local government alliances, to build resilience against extreme weather events. 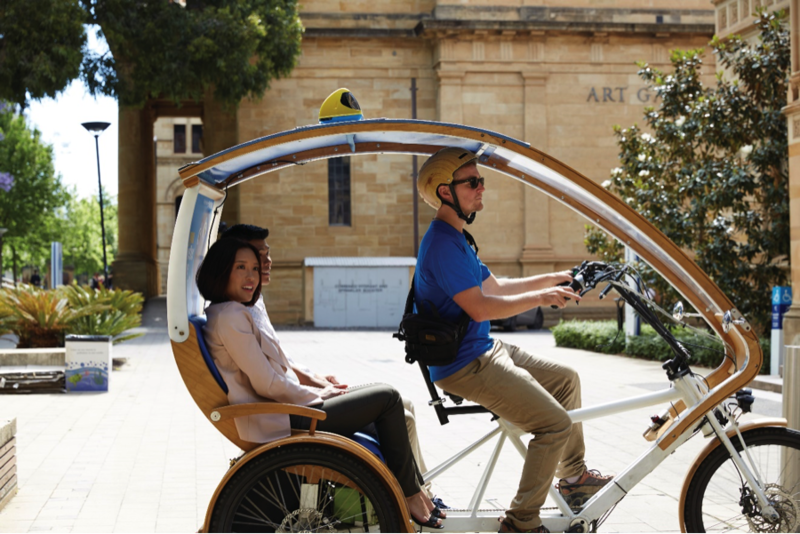 Being the capital city of the driest state in the driest continent of the world, Adelaide’s reputation for resourcefulness, inventiveness and progressive thinking have emerged through the necessity to act more sustainably. Adelaide derives most of its electricity from local privately operated gas-fired plants (Torrens Island Power Station and Pelican Point), observing strict controls to the ensure protection of the local marine environment, as well as from the national network. Gas is supplied from the Moomba Gas Processing Plant in the Cooper Basin via the Moomba Adelaide Pipeline System and the SEAGas pipeline from Victoria. South Australia generates 18% of its electricity from wind power, and has 51% of the installed capacity of wind generators in Australia. South Australia is the leading producer of wind power in Australia and over 50% of the state’s electricity is generated from renewable energy sources. South Australia’s net greenhouse gas emissions have been reducing since 2005. The latest estimate indicates that net greenhouse emissions in 2012/13 were nine per cent below the 1990 baseline. South Australia’s Gross State Product (GSP) during this period grew more than 60 per cent from $55.2 billion in 1989/90 to $94 billion in 2012/13, demonstrating that economic growth can be decoupled from growth in greenhouse gas emissions. For many tens of thousands of years South Australia’s first nations people ingeniously survived sustainably on what the land and waters provided through sophisticated agricultural practices and skilled husbandry. (Pascoe,B. 2014) (30) Harvesting and storing cereals and grains, cultivating nuts, seeds and deep rooted vegetables, using fire to replenish food resources, and building complex aquaculture systems. 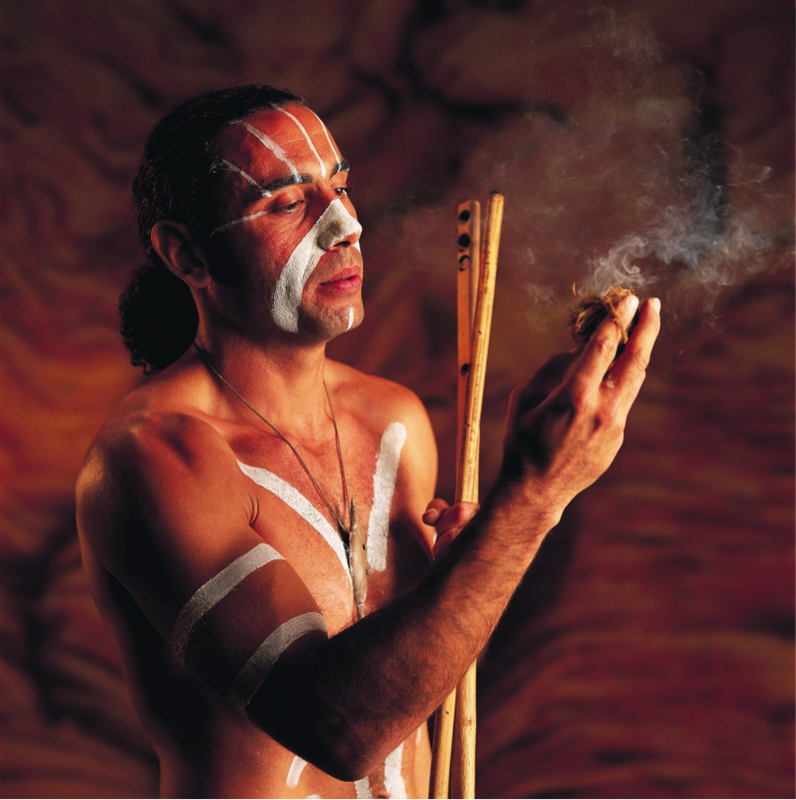 Aboriginal lore prescribes the responsibility to nurture and respect the nature and the environment. Dreaming explains that everything in the environment; the underground, the land, the waters, the sky, fire, the wind and weather, plants and animals - holds the living essence of ancestors. While it takes deep time to evolve the necessary customs, rituals, recipes, skills and ethics to live in a place that authentically and sustainably feeds its people, Adelaide and South Australia has the privilege of having deep and traditional Aboriginal knowledge and practices to inspire and guide the future of agriculture. As the effects of drought devastate agriculture in South Australia, there is an increasing recognition of the need to transform agricultural practices. Being one of the driest inhabited places on Earth with a population scattered across a large area, water security is an ongoing challenge for Adelaide and South Australia. Adelaide’s water is sourced from a range of different places including the Murray River, desalinated sea water and local reservoirs: Mount Bold, Happy Valley, Myponga, Millbrook, Hope Valley, Little Para and South Para. The yield from these reservoir catchments can be as little as 10% of the city's requirements in drought years and about 60% in average years. South Australia and importantly the city of Adelaide are at the end of the esteemed Murray-Darling Basin river system that produces one third of Australia's food supply and supports over a third of Australia's total gross value of agricultural production. The majestic lifeline comprises Australia’s three longest rivers; the Darling (2740km long), the Murray (2520km long) and the Murrumbidgee (1575km long), which has existed for over 60 million years, since Australia split from the giant super continent, Gondwanaland. According to the Ngarrindjeri, the Murray used to be just a stream. It became the mighty river we know today when local 'hero spirit’ Ngurunderi chased a giant cod (Ponde). As the fish swam ahead of Ngurunderi, it widened the river with sweeps of its tail. When Ngurunderi got to Tailem Bend (Tagalang), he threw a spear at the giant fish. The spear caused the cod to surge ahead of Ngurunderi, creating a long, straight stretch in the river. South Australia capped its water use from the Murray River in 1969, campaigned strongly for a basin-wide plan Murray-Darling Basin Agreement which was established in 2012. The agreement mandated sustainable water usage ensuring the whole system retains the water it needs to stay healthy, for the benefit of the environment and the 3.4 million people nationally who rely on the system for drinking water, food production and livelihood. A Royal Commission is currently underway into allegations that water is being illegally taken from the Murray Darling Basin River System by upstream states for agriculture. The Australian $50 note features Ngarrindjeri man David Unaipon. Ngarrindjeri are the traditional Aboriginal people of the lower Murray River and the Coorong in South Australia, a nation comprising eighteen independent territorial clans and arguably most impacted by the destruction of the Murray-Darling River system. During the millennium drought (1995-2009) water levels dropped so low that ancient traditional Ngarrindjeri burial grounds were exposed. Water Sensitive SA, established by the Adelaide & Mount Lofty Ranges Natural Resources Management Board exists to provide government and developers with technical information and expertise. SA Water's largest desalination plant is the Adelaide Desalination Plant (ADP) at Lonsdale. The plant was built to provide long-term water security for South Australia and has been contributing to delivering drinking water since 2011. In full operation, the plant can produce 100 gigalitres (GL) per year, which is approximately half of Adelaide's annual water needs, and while it has one of the smallest carbon footprints of any desalination facility in the world, using energy from renewable sources, desalination remains a financially and environmentally expensive way to treat water and considered a last resort and not to offset inefficient water use practices. Water-sensitive urban design (WSUD) is crucial to the sustainable use and re-use of water in urban development and buildings. The South Australian Government has developed a Water Sensitive Urban Design policy with established targets for new developments and technical manual for developers and builders. WSUD integrates the total water cycle from all sources (including rainwater, storm water, groundwater, mains water and waste water) into urban development and building processes. WSUD measures and tools are applied to residential, commercial and industrial developments and buildings and range from the storage, treatment and use of runoff to water-efficient landscaping. South Australia has the highest per capita recycling rate in Australia and among the best in the world – nearly 80 per cent of total waste generated is recovered. (31) Since 1977, South Australia has had a Container Deposit Scheme, which diverts almost 97% of bottles and drink containers from landfill to recycling.South Australia has achieved a 27 per cent reduction in waste to landfill since 2003. South Australia’s current Waste Strategy includes targets to reduce municipal solid waste to landfill by 70 per cent by 2020; to reduce commercial and industrial waste to landfill by 80 per cent by 2020; and to reduce construction and demolition waste to landfill by 90 per cent by 2020. Adelaide’s has a metropolitan-wide public transport system, consisting a bus system (with diesel and electric lines) and a metropolitan tram through the city centre to the inner north-west suburbs. Digital technologies will continue to play an increasingly important role in contemporary life and access to high-speed, secure internet is fast becoming a foundation of prosperity around the world. Adelaide is on its way to building the fastest, most secure and robust data networks in the southern hemisphere by installing a revolutionary high-speed, high-performance fibre optic data network that is being rolled out to commercial buildings across the City of Adelaide. The Ten Gigabit Adelaide is network will enable businesses and organisations to share and receive high volumes of data at phenomenal 10Gbps data speeds. In January 2015, CISCO declared Adelaide as the first smart and connected ‘Lighthouse City’ in Australia through its leadership in deploying free outdoor wireless technology across the city. It is a focus on wellness, rather than mental illness that characterises Adelaide’s approach to mental health and wellbeing. Adelaide and South Australia’s approach to wellbeing and mental health aspires to reflect this traditional wisdom recognising that it encompasses the health of the whole individual, their environment and the whole community. It acknowledges the interplay between all elements within human health; biological, mental, social, environmental, spiritual, and economic and considers broad ranging health determinants. Almost half (765,000) of all South Australians aged 16–85 years, are likely to have experienced symptoms of mental illness at some time in their lives. (34) In any twelve-month period, almost one in five or nearly a quarter of a million South Australians are likely to experience symptoms of one of the common forms of mental illness (anxiety, depression or mood disorders, substance use disorders). It is estimated that approximately 53,000 South Australians experience severe mental illness in any twelve-month period, either episodic or chronic, often with substantial effects on ability to function in society and at home, and in great need of care and support. Mental illness is the third leading cause of disease burden in SA, behind cardiovascular disease and cancer. However, for South Australians 24 years and under, mental illnesses are estimated to be the leading cause of burden of disease in our community. The age of onset of around half of the more common mental illnesses is by 14 years, and around three-quarters by the age of 24 years. Alcohol and other drug problems affect many South Australians and have both personal and social impacts across the community affecting families and relationships as well as having health, economic and criminal justice consequences. In South Australia in 2016, 5.9% reported drinking alcohol daily and 15.7% reported using an illicit drug in the last 12 months, similar to Australian statistics. The most commonly used illicit drug in South Australia in 2016 was cannabis (10.7%) followed by cocaine (2%), meth/amphetamine (1.9%) and ecstasy (1.6%); note that ecstasy use decreased significantly from 2.8% in 2013. The percentage of men who reported using illicit drugs was higher than that of women (18.7% compared with 13.2%) and the age group with the highest percentage of people who reported recent illicit drug use was aged 18-24 years (28.9%). Strengthen children and young people’s participation in society. Following extensive public engagement, the South Australian Suicide Prevention Plan 2017 - 2021 was established to focus on raising awareness, breaking-down the stigma associated with mental illness, increasing social connection and responding compassionately. SA Health has a comprehensive range of public mental health services for children and adolescents, adults and older people in SA. Services are provided through community health centres and hospitals and to individuals and families in their own homes. by the State Government and a broad network of non-government organisations. The state offers a Mental Health Triage Service, staffed by mental health professionals which operates 24 hours a day, 7 days a week as a main point of information and referral to mental health services in a mental health emergency or crisis. (39) A key element of the South Australian approach to suicide prevention is the establishment of Suicide Prevention Networks within local communities to start life-saving conversations, breakdown the stigma, increase individual awareness of the thoughts and feelings that lead to suicide and provide information on how to respond and support those bereaved by suicide. Embedding Positive Education across Adelaide and South Australian public and private schools. During a four-week period in May/June 2016, City of Adelaide residents were invited to participate in a Wellbeing and resilience Centre survey (PERMA+ survey) using an adapted survey instrument; the PERMA + survey, which measures PERMA (Positive emotion, Engagement, Relationships, Meaning and Accomplishment) as well as Optimism, Physical activity, Nutrition, and Sleep. 654 individuals participated in the PERMA+ survey, of which 484 individuals identified as residents of the City of Adelaide. The overall mean of PERMA for ACC residents was 7.2, indicating a level of wellbeing that is slightly higher than the global average score of 7.1. Adelaide City Council residents scored higher than the global average PERMA, females scored slightly higher than males, those who scored higher than the group’s average of 7.2 were aged 65 to 74 years, those 18 to 24 years had lower PERMA, one in five residents had very low overall PERMA (less than 6.0). Dignity: South Australians are treated with dignity and respect, and their human rights are upheld, in their interactions with mental health and wellbeing services and in the broader community. Person first: People across the lifespan are recognised for their own unique capacities, strengths and needs in building, maintaining and strengthening their mental health and wellbeing, and that of their communities. Support and connection: Networks of support and connection are recognised as integral to, and are included in, building, sustaining and strengthening the mental health and wellbeing of our loved ones and communities. Meaning and purpose: Opportunities for people to explore meaning and purpose, through activity and/or learning, are recognised as integral to building positive self-identity and community connection. Inclusion and diversity: People are recognised as having unique social, cultural and spiritual needs and these are included in building, maintaining or sustaining mental health and wellbeing. Recovery: People are recognised as having unique capabilities to heal, learn, develop and grow with regard to their own experience of building, sustaining and maintaining mental health and wellbeing. Equity: Mitigating social and health inequities arising from differing access to social supports such as housing, employment, healthcare and education due to life circumstances is integral to building, sustaining and maintaining our community’s mental health and wellbeing. Collaboration and partnership: People with lived experience, services and communities work together to respond to, build and strengthen mental health and wellbeing, with a commitment to co-production at all levels. In 2018, the new South Australian Government appointed a Minister for Health and Wellbeing (previously the Minister for Health). Up to 125 individuals sleep rough in Adelaide every night. An action plan has been developed to achieve functional zero homelessness in Adelaide by 2020, with a coalition of community service providers, government agencies and private sector organisations committed to leading the charge. Established in 2003, Adelaide’s Thinker in Residence program was a global first to address urgent challenges or to explore areas of opportunity, through new policy development and systems reform. For over a decade, the program informed the State Government’s response to some of the most important issues of the last decade including health, education, water, climate change, manufacturing, transport and road safety. Some significant impacts of the program include the development of Health in All Policies (Ilona Kickbush), the establishment of the Australian Centre for Social Innovation (Geoff Mullgan), the Wellbeing and Resilience Centre (Martin Seligman), the state-wide measurement of progress in children’s development through the Australian Early Development Index (Fraser Mustard), and the construction of Common Ground Adelaide sites to house the long-term homeless (Rosanne Haggerty). The program has been adapted is managed by not-for-profit sector by the Don Dunstan Foundation. Health in All Policies acknowledges that health is influenced by a wide range of social, economic, political, cultural and environmental determinants of health that require joint policy responses. Health in All Policies was established in South Australia in 2007 as a principal recommendation of Thinker in Residence Professor Ilona Kickbusch, to strengthen the focus on improving health and wellbeing through the goals of other sectors. Public Health is what we do as a society collectively to create the conditions and environments that support the wellbeing of all South Australians. Public health works to ensure that individuals and communities avoid illness and injury and opportunities are created for social inclusion and building a strong and resilient community. Subsequently, the South Australian Public Health Act 2011 was established to provide the necessary legislative framework for South Australia to better respond to emerging and traditional public health challenges and is underpinned by mechanisms to systematise Health in All Policies across government. The scope of the Act reflects public health in its broadest sense, covering the foundational role of public health in protecting against environmental hazards and preventing communicable disease and extends to the promotion of healthy environments and lifestyles to address chronic conditions. The Act recognises that many factors impact on the health of communities including the social, economic and physical environment as well as individual characteristics and behaviours. Building on the strength of the previous State Public Health Plan the revised draft plan identifies a clear vision: A healthy, liveable and connected community for all South Australians, where communities are friendly, safe and sustainable with well-designed places that support physical and mental health and wellbeing. The draft plan recognises the importance of urban design in relation to health and wellbeing in the context of being active, connected and engaged in community and cultural life. This includes being able to walk or cycle to local services, easily access public transport to larger centres and the right to enjoy being active in parks and other recreational facilities. The plan also acknowledges the need to celebrate South Australia’s rich diversity and offer community activities accessible to everyone as well as the importance of community participation and involvement in local decision making. Established in 1869, the Adelaide Central Market has been a thriving hub of food and culture in the heart of the city, for over 149 years. 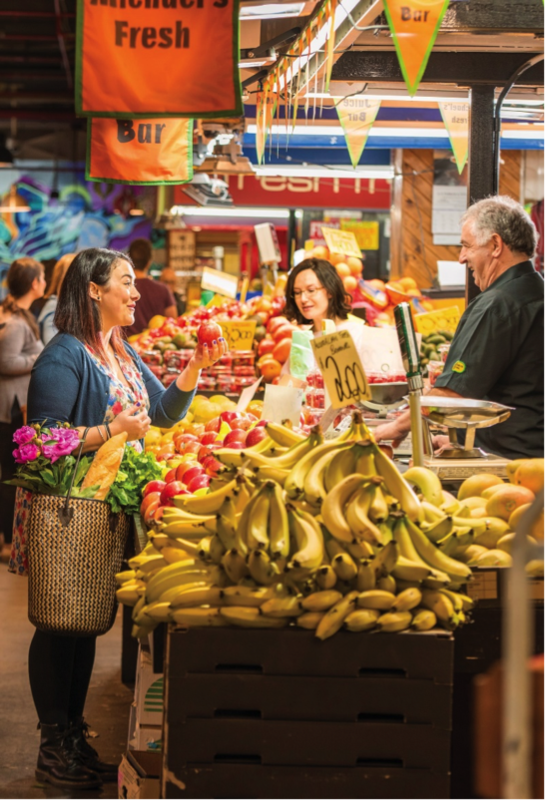 With over 70 traders under one roof, the Adelaide Central Market is one of the largest undercover fresh produce markets in the southern hemisphere and remains Adelaide’s premier food destination of multicultural cuisine and fresh produce. 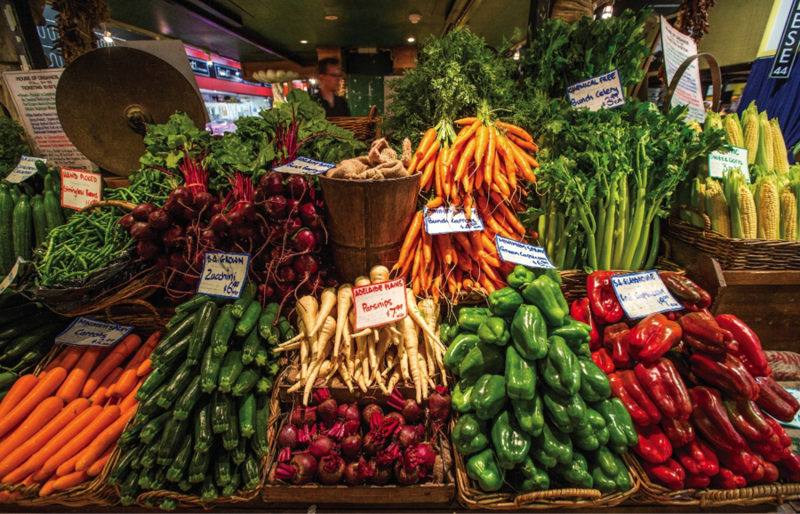 The market is a feast for the senses offering a huge range of multicultural cuisine and fresh produce including fruit and vegetables, meat and poultry, seafood, cheeses, bakery, smallgoods and health foods, along with some of Adelaide’s most popular cafes and eateries. Over 9 million people visit the market every year and is South Australia’s most visited tourist attraction. The Adelaide Park Lands is the largest inner urban park system in Australia. 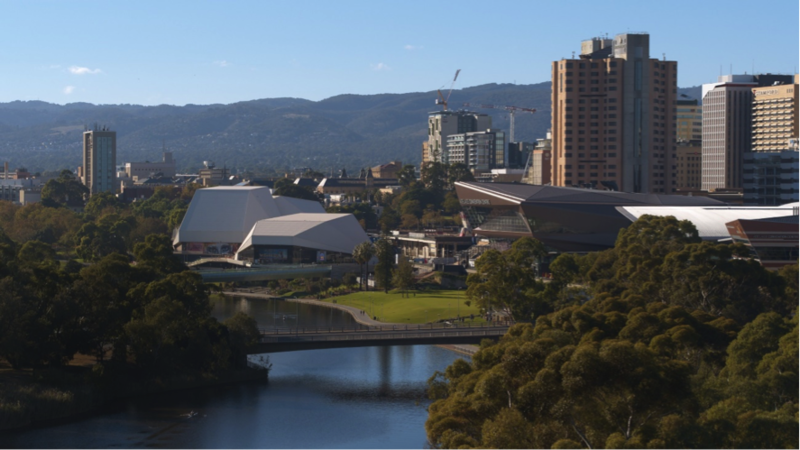 The 800 hectares of Park Lands surround the city of Adelaide and provide public space enjoyed by over 8.9million residents and visitors annually for diverse arts and cultural events, sports and informal recreation activities. 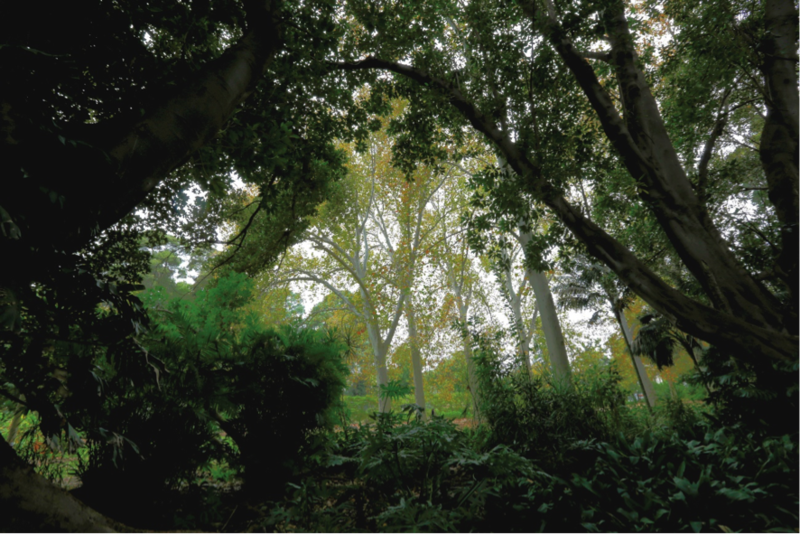 The Adelaide Parklands are listed on Australia’s National Heritage register and widely regarded as a masterwork of urban design giving rise to Adelaide’s identity as a city in a park. In recognition of Kaurna people’s longstanding occupation, conservation and cultural connection with the land, the City of Adelaide are iteratively formally recognising a number of Kaurna heritage sites and installing signage in English and Kaurna languages, in consultation with Kaurna community culture and heritage groups. Interpretative signage has been installed in the 29 Parks surrounding the City. This initiative enriches and deepens residents and visitor’s connection to place. A 30 km Linear Park runs westward from the Adelaide Hills, through the Adelaide CBD and Parklands, to the sea used daily by thousands of cyclists and walkers to commute and recreate. It was completed in 1997 as the first of its kind is a visionary and innovative response to what began as a flood mitigation scheme along the River Torrens. 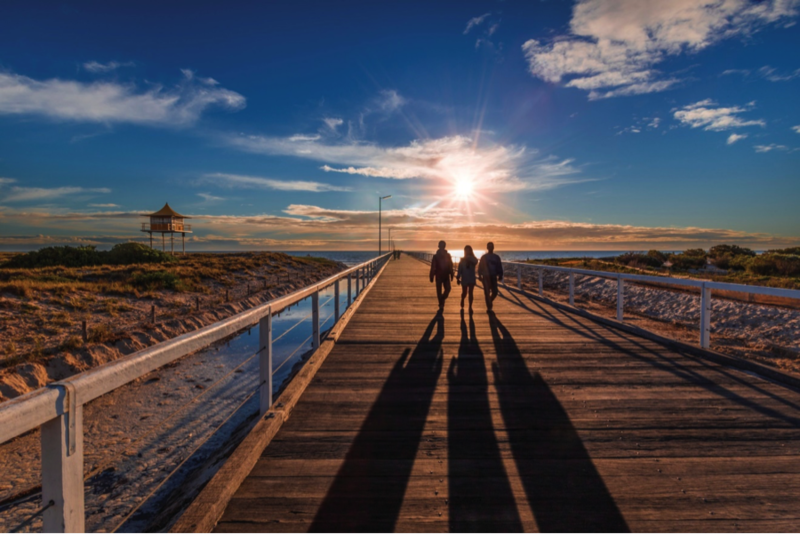 Coast Park is an initiative to develop a continuous two- way linear park for walkers and cyclists along 70 kilometres of Adelaide’s metropolitan coast from North to South. Jointly funded by the state government and the six Councils located along the foreshore, Coast Park will see the delivery of about 60 separate projects which will provide public access along the length of the coast, provide a pedestrian and cycling-friendly foreshore environment, and recognise and enhance the diversity of the natural environment through a large-scale environmental management program. Approximately 65 per cent of the coastal linear park has now been completed (2019). Bowden is the state government’s first higher density urban infill project. 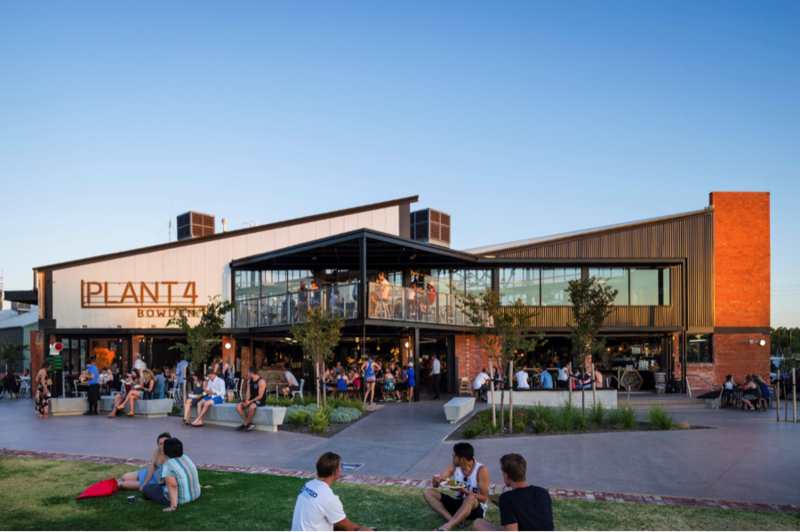 Located 2.5 kilometres from Adelaide’s CBD on 16 hectares of land, on a formal industrial site, bordered by parklands, the project sets new standards in urban renewal, delivered through a partnership between the state government and the private sector. More than 600 homes have been sold and more than 3,500 residents will move in over the coming decade. Bowden homes meet the 6-Star Green Star–Communities rating assessed across five impact categories including liveability. 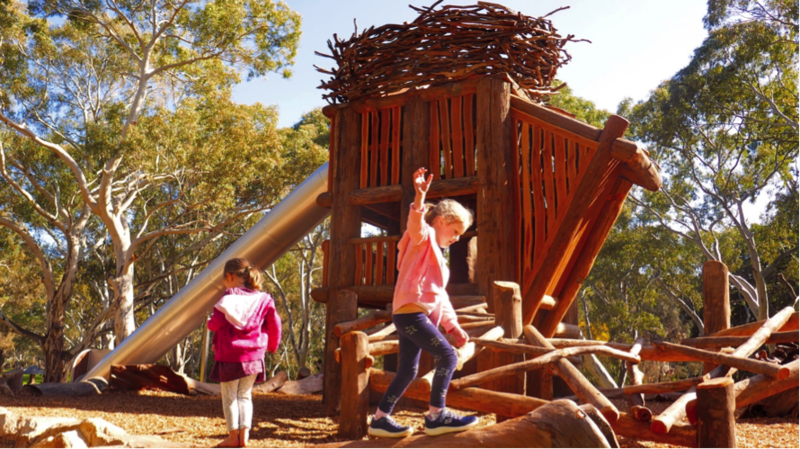 Adelaide’s biggest new playground is based at the entrance of Morialta Conservation Park, just 10km from the central business district. There are five play areas: Frog Island, Eagle’s Perch, Great Snake, Bird Nests, that comprise climbing boulders, creeks, mudpools, paths and climbing trees. Mukanthi represents the growing interest in nature-based play in Adelaide. Parents and the community express growing concern about changing nature of childhood in the context of having busy lives, the structured nature of childhood activities and ubiquitous exposure to digital technology and related impacts on children’s health and wellbeing. 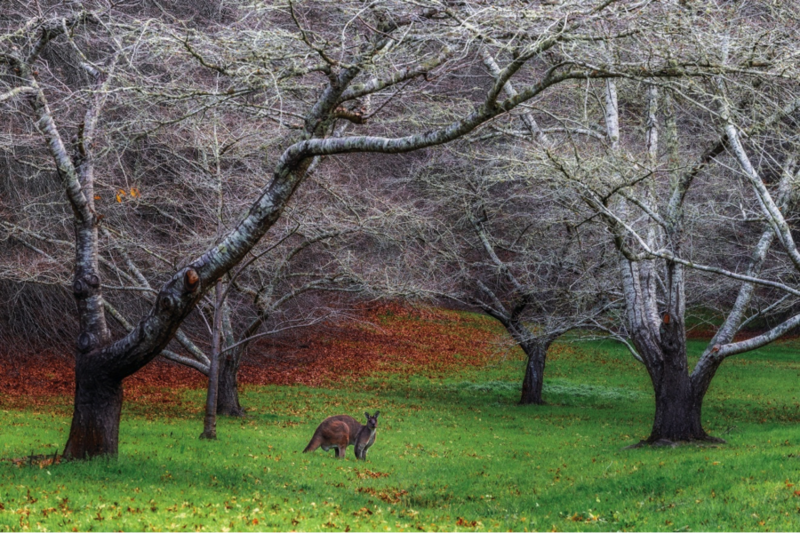 Glenthorne National Park will be a 1,500-hectare national park in Adelaide’s southern suburbs. 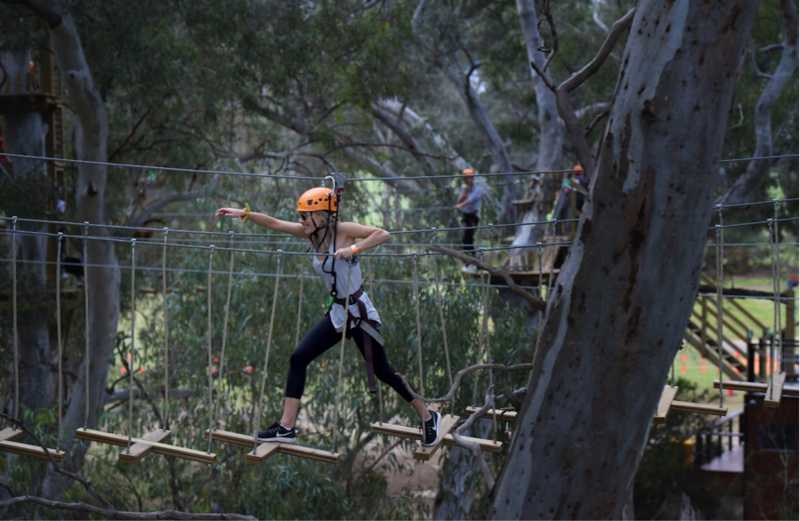 The recreation space will comprise nature playgrounds, walking and bike trails, picnic areas, camp grounds and 200 hectares of native revegetation. 1. Measure and actively build wellbeing at the population level. 2. Adopt the Principles of Good Design in the approval of private and public development; context, inclusivity, durability, performance, sustainability. 3. Strong citizen engagement – adopt a range of consultation platforms for engagement where citizens can find and provide feedback on a range of topics. 4. Healthy Parks, Healthy People – adopt a framework that promotes physical activity in nature, childhood development and nature, green infrastructure and urban settings and biodiversity, conservation and human health. 5. Invest in renewables – Adelaide’s aspiration to be the world’s first carbon neutral city is driving important initiatives across industry, infrastructure and public engagement. 1. Explore and better define South Australian values to inform all decision making that reflects our shared identity. 2. Be inspired by traditional Aboriginal knowledge, experience and connection to the land and courageously face and heal the impact of colonisation. This would need to be scoped and led by Aboriginal people but might include English/Aboriginal dual naming of municipalities, extended Aboriginal language urban signage and might extend to routinely teaching Aboriginal language in all South Australian schools. 3. Utilise the existing arts and creative industries capability to contribute to solving persistent social issues including improving wellbeing, mental health, reducing substance abuse, welcoming refugees and international students. Draw inspiration from the Healthy Parks, Healthy People initiative. 4. 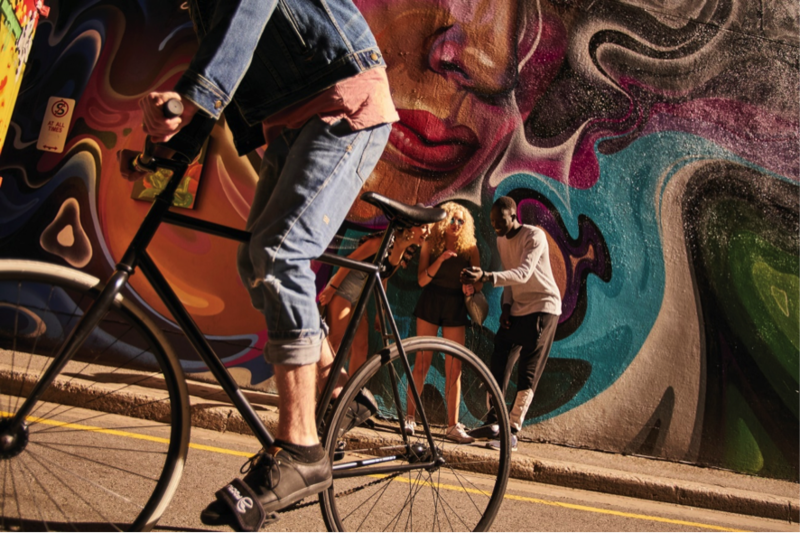 Realise Adelaide’s potential as one of the world’s great cycling cities, celebrate cyclists and make active transport the most convenient and popular way to get around. 5. Systemise the consideration of Cultural Impact into decision making at the municipality and State Government level through Cabinet Submissions. 6. Use smart technology to manage green infrastructure as a physical asset, establish a green infrastructure register, monitor the health and lifecycle of urban plants including succession planning to strengthen place attachment and mitigate the urban heat island effect. 7. Re-purpose the Botanic Gardens and State Herbarium of South Australia’s Bicentenary Conservatory (the Conservatory) as an innovative and stimulating global destination hub for the science of plants in space, bringing together South Australia’s expertise in arid plant science, wellbeing and space industries. 8. Consider planting a sizable urban forest northwest of the city to intercept the hot north winds and influence the microclimate of the city. 9. Build a stronger mindset – celebrate curiosity, courage, and confidence, embrace (not fear) challenges, see effort as crucial in the path to mastery and find inspiration (not threat) from the success of others. South Australian mental health and urban professionals across planning, architecture, landscape architecture, disability services and arts/culture. Public Art Commissioning Guidelines. Arts South Australia. 2016. Publications - Waste Strategy 2015-2020, Green Industries SA, Government of South Australia, https://www.greenindustries.sa.gov.au/publications-waste-strategy-2015-2020. Professor Helen Milroy, Zubrick et al., 2010. Working Together: Aboriginal and Torres Strait Islander Mental Health and Wellbeing Principles and Practice. Commonwealth of Australia.